Since June 2005, EMC has been the main sponsor of the Carmarthenshire Community Development Scheme which enables children within Carmarthen to participate in various sporting activities such as football, cricket, martial arts, rugby etc. It is envisaged that the Scheme will develop partnerships with sports clubs, school, drug agencies, and local authorities and give opportunities to disadvantaged children. We are delighted to be able to help such a programme which will benefit the youth of the community. 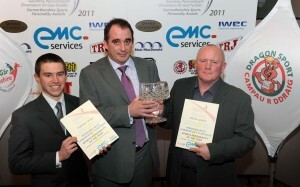 EMC has been the main sponsor of the Carmarthen Town Sports Awards for the last few years and was also the main sponsor for the Carmarthenshire Sports Personality Awards for 2011. EMC also regularly supports various local sports functions through advertising, sponsorship etc. We also maintain links with both Carmarthen Town and Llanelli Football clubs. EMC also sponsors the kits of many junior local football teams – Carmarthen Town, Pontardulais, Johnstown, Y Dderwen school. EMC has an active training programme which involves employing and training its own apprentice electricians to enable us to produce staff to the highest level that clients have come to expect. We believe that the investment in such an approach will benefit both the company and the individuals concerned.We currently employ 5 apprentices at various stages of their training.